MAN Automotive Concessionaires Corporation (MACC) has just recently become the third company in the Philippines, after CW Home Depot and Diamond Rent-A-Car, to choose the Santana sub-compact sedan for its corporate fleet. 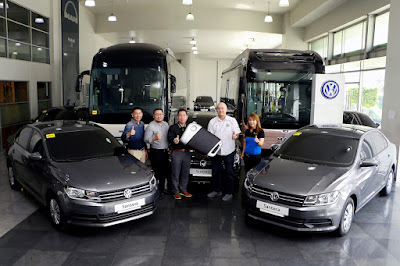 Last October, Volkswagen Philippines turned over Santana units to MACC, the exclusive Philippine importer, distributor and aftersales provider of MAN trucks and buses since 1989. Today, it maintains the largest facilities of any MAN dealer in Asia with its two MAN Truck & Bus service centers. Initially concentrating on supplying MAN buses to leading public transport companies, in recent years MACC introduced MAN trucks to the local market, serving premium quality heavy duty trucks to haulers and construction companies. MACC also carries other brands such as Schwing Stetter, DY Cranes, Hyva and Amco Veba. CW Home Depot, Diamond Rent-A-Car, and MACC all chose the Santana for its fleet accounts because of its German automotive craftsmanship and design, and the ease of use and maintenance.